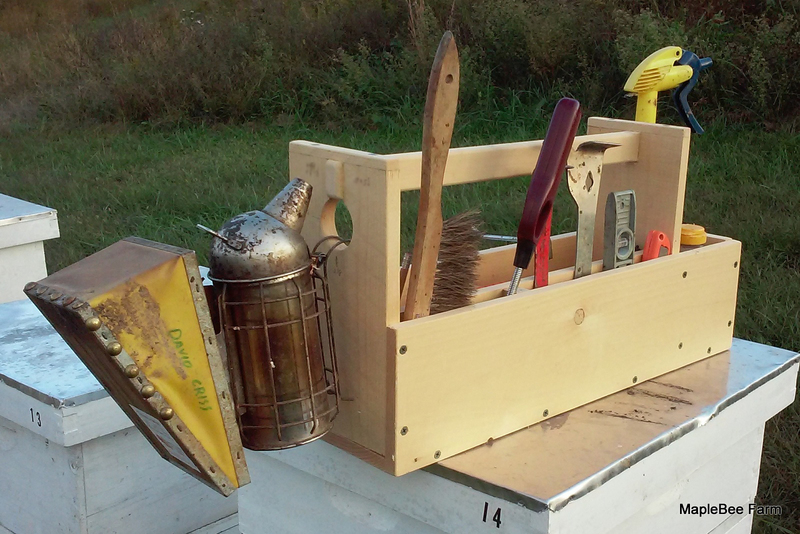 A toolbox for beekeepers. Take all your tools with you in the bee yard and keep them organized with this beekeeper toolbox made from rough sawn western cedar with a tulip poplar handle. Slots and divided compartments keep tools handy and organized. Return your tools to the same spots each time and they’ll be easy to find. Tools are NOT included. You get just the box. Ships fully assembled and ready to use. These boxes are handmade one at a time. Lightweight yet strong, the dimensions of the box are 22”L x 7”W x 11”T, weighs 6 lbs. There will be a few small tight knots, the color and saw pattern of the wood can vary from the photos, and they all have a rough sawn rustic look. Finished with a coat of linseed oil. When you open a hive you need all your tools to address whatever situation you might encounter. With a toolbox you won’t need to look for a tool or go back to the shed for that one tool you thought you would not need.